PowerMD’s Patient Management software is a great way to add a new patient, or even find the patient you would like! 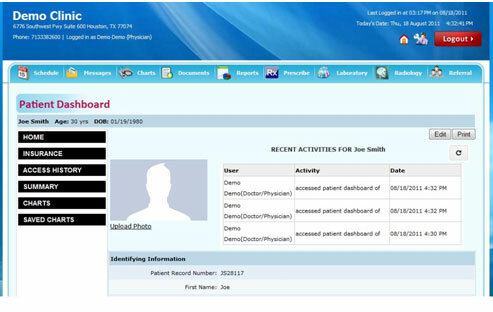 Our easy-to-use interface shows for a very simple, yet pertinent Patient Dashboard. Since patients will be pouring into your practice, it’s good to know just how fast it is to manage all your patients! In order to add a patient, simply enter in the patient’s basic personal information and immediately get prompted to the next screen. In this screen, you’ll be able to input the patient’s email into the contact information so that future notifications and scheduled visits are seamlessly sent by secure means. Other pieces of the patient’s information such as address and demographics allow for a more comprehensive patient file. The Patient Dashboard finalizes updates new patient’s information in an easy-to-view format! What happens next? Well, the patient is stored into the Patient Dashboard where insurance, access history, summary, and charts provide a truly detailed version of the patient’s charting information. It all seamlessly comes together!